Most powerful VW Passat ever on sale | What Car? The most powerful Volkswagen Passat ever has gone on sale. 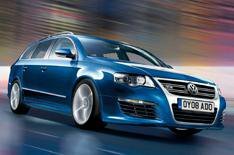 The Passat R36 is powered by a 294bhp 3.6-litre V6 engine with 258lb ft of pulling power. A semi-automatic six-speed gearbox and four-wheel-drive system come as standard. As a result, the saloon model accelerates from 0-62mph in 5.6secs and the estate in 5.8secs. Top speed is electronically limited to 155mph. Other features include 18-inch alloy wheels, lowered suspension, a new front bumper and twin exhausts. Inside, the seats have been designed to give extra support, there's aluminium styling on the dash and the pedals are made of alloy. Prices for the saloon start at 30,990 and for the estate at 32,150.